This article aims to guide you on how to add more modules to your content. 1. Click the blue plus icons positioned above and below every module in a document. 2. Click the type of module. All of the module types are the same rich text editor tool, but the "Titled" option gives you some titles to choose from. When you first create a new document you will see a single rich text editor module in the "Toolbar" region. The module has a toolbar with familiar text editing functions, including the option to embed video from sources like Teacher Tube and Kahn Academy and to create links to resources uploaded to the group locker. In the upper-right of the editor module, there are icon buttons for saving, canceling and deleting. 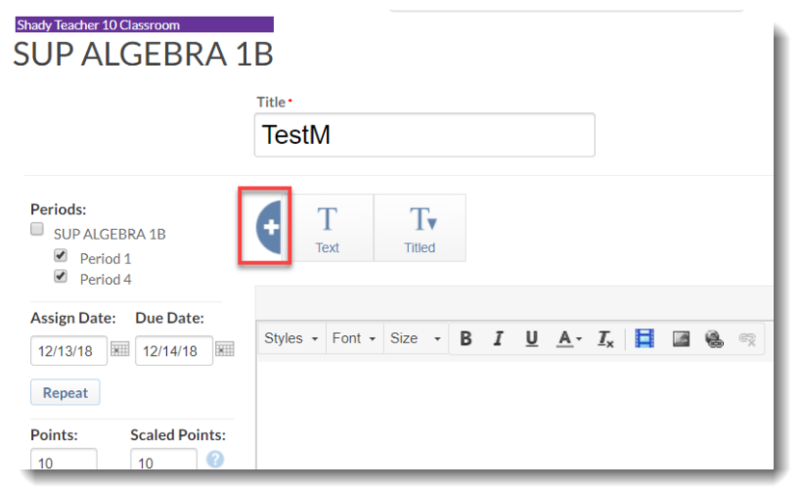 Use the Publish button at the top-right corner of the content editing area when your document is ready to be shared with teachers or other Curriculum Groups. Once published, saving changes in any module automatically republishes the document. The added curriculums will be visible under the Assignment List tab under Gradebooks. For more information on Curriculum, visit Editing Content in Curriculum Groups and Creating Curriculum.